Thursday Morning Wood Post-Halloween Wrap Up | sweet juniper! I had some serious concerns about Halloween this year, mostly because Juniper insisted on being a robot, something she came up with on her own, as far as I know, with no instigation from either of us. I was concerned because I had to relinquish control over her costume. 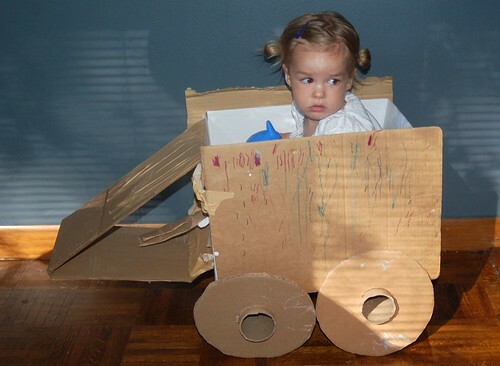 A robot, I knew, would involve cardboard boxes and wires and electrical tape, and that's not my area, it's her father's. I can hold my own with thread and fabric, but he's always on the lookout for an excuse to spray paint something or bust out the hot glue or staple guns. I knew she couldn't wear a robot costume during school, so we let her be Medusa in the morning, which was easy because she already had the hat. 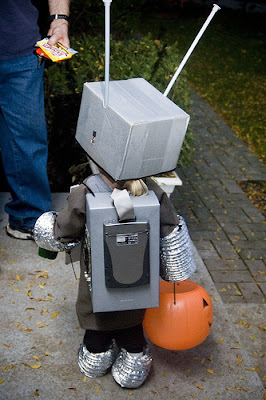 So strong was her desire to be a robot, she wore that whole thing and walked around the neighborhood for two hours. She didn't cry when people looked at her, talked to her, or tried to touch her. 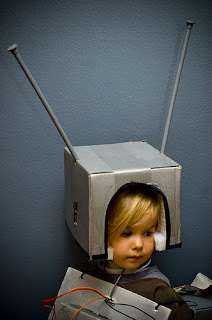 Instead, she said trick or treat, umprompted, in her little robot voice.